The decade of the comic book, the decade in which movie studios started taking comic books seriously, has led us now to The Watchmen, Alan Moore’s “unfilmable” graphic novel published in the late eighties. We no longer get just a socially inept person in a cape and tights battling some megalomaniac for pure escapism, although we get the occasional Ghost Rider to those ends. What we get now are fleshed-out plots, with filmmakers lending an eye to treating the comic book story just like any top drama like The Godfather, giving it legitimacy, something the genre couldn’t boast until the last ten years. The first attempt at a comic book adaptation with more on its mind came with 2005’s V for Vendetta, a movie I really didn’t like too much but admired for its ideas. V for Vendetta, also adapted from Moore material, became what sci-fi film became in the late sixties with 2001: A Space Odyssey and yes, Planet of the Apes. Comic book adaptations hit an all-time high last year with The Dark Knight, a movie not so much about political importance, but from a storytelling perspective we hadn’t seen anything like it, even with previous action-adrenaline highs Spider-Man 2 and X2: X-Men United. M. Night Shyamalan’s 2000 not-a-comic-book Unbreakable is looking more and more prescient every new year. Quietly, it set the tone for what comic book adaptations could do. So now we come to Watchmen, a graphic novel with one of those “best all-time somethings” attached to it, a movie made possible from director Zack Snyder’s previous mega-hit comic adaptation 300. 300 was not much more than fun spectacle, but with its striking visuals and whiz-bang camerawork, it fits nicely into the idea that comic book movies could be more. Watchmen carries with it the possibility of being not only a spectacle and a storytelling benchmark, but also fulfill the promise of V for Vendetta’s social commentary being a legitimate comic book topic. It’s the mid-eighties and superheroes (vigilantes) have been declared unlawful. They helped win the Vietnam War, but their cruelty leads to their social demise. It also somehow paves the way for Richard Nixon to get elected five times. 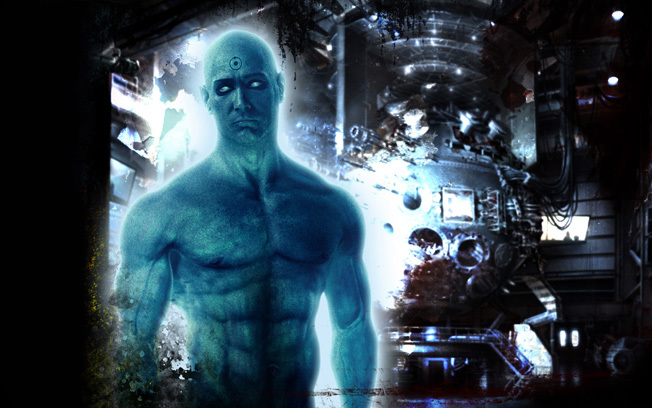 The Cold War between the U.S. and the Soviets is still a real fear, and two of the former superheroes, the wealthy Adrian Veidt (Matthew Goode) and the blue energy anomaly Dr. Manhattan (Billy Crudup) are working on a source of energy that could bring peace to the world. Something is amiss, however. Many of the old heroes are getting killed or sent to asylums. After the sociopathic Comedian (Harry Dean Morgan) is offed in his apartment, a mysterious masked figure named Rorschach (Jackie Earle Haley) investigates it. The deaths are made to look like his work. Meanwhile, other heroes like Nite Owl (Patrick Wilson) and Silk Spectre (Malin Akerman) are trying to live life as Dan Dreiberg and Laurie Jupiter, respectively. Laurie is falling out of love with Dr. Manhattan, aka, Jon Osterman, because he’s losing touch with humanity. Able to work complex physical realities just by basically being a complex physical reality, Osterman lives in different worlds and times simultaneously, and is becoming increasingly distant. Laurie then falls into the arms of Dan, creating a bit of a love triangle. For the most part, here’s where we see the story develop into a connection between past and present. Rorschach’s eventual imprisonment gets the ball rolling into the main plot of the heroes deciding to return and to find who is killing their former colleagues, and it also begins to delve into the socio-political reasons for these events. Because Watchmen takes so long to get into this area, the 2 hour, 45 minute epic is a bunch of cool stuff with a bunch of plodding, unnecessary padding. This movie easily could have been told in 2 hours, but we have hiccups with the love triangle, the secret Laurie’s former superhero mom Sally (Carla Gugino) carries with her, a long origin story involving Jon’s transformation into Dr. Manhattan and the love he lost, Janey Slater (Laura Mennell). Also, lots of the action we get in the middle of the picture is pretty uninteresting to the overall workings of the plot: Dan and Laurie get some “practice” in on an Asian gang that corners them in an alley. While you’ll see some reactionary bloodletting here, it doesn’t serve much function. The last thirty minutes are very good. I’ve never read Watchmen, but with its length and the manner in which the story is told, I can only imagine the movie tries to cram as much of that book in as possible and it suffers when it translates over into cinema. With the techniques available in film, some creative editing could have definitely helped this movie run at a smoother pace. As is, what we have here is an example of a genre thrown into neutral, still showing promise but not quite taking it to the level where we all know it can be.